Gold prices dipped way below the $1,300 mark on Tuesday leaving behind early July’s hopes of a comeback, with analysts warning prices have still plenty of room to fall even further. 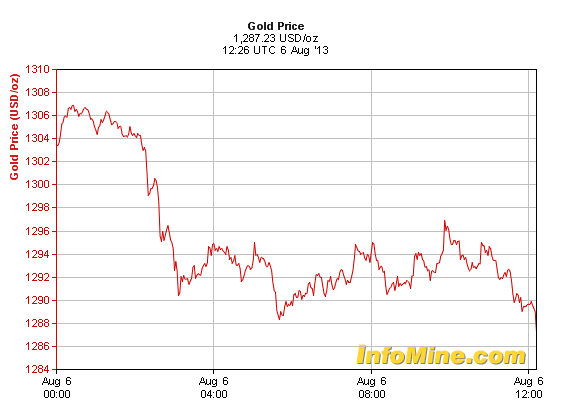 The shiny yellow metal was down to $1,286 at 8:30 am ET at Comex, far below its peak of nearly $1,350 in late July. Despite gold has enjoyed a 14% increase from its June low, driven mainly by strong physical demand in Asia, western investors’ enthusiasm for the precious metal keeps dropping. The US Commodity Futures Trading Commission latest data on positioning shows investors cut their long positions in gold last week. And, at the same time, outflows from gold exchange traded funds began to accelerate once again. Since the historic highs of 2011, gold has dropped more than 30%. In 2013 alone, investors have kissed goodbye several years of gains. Only in the first six months of the year, gold has dropped 22%, the worst fall since modern trading commenced in early 1970s. “We believe that expectations for early QE tapering will eventually be unwound and together with these so will some of the short positioning in gold,” the consultancy said in a monthly report to clients, predicting that prices could rally to close to $1,600 a troy ounce towards the end of this year. The sentiment is shared by the World Gold Council, which said Tuesday a huge drop in the recycling of gold jewellery was helping to rebalance the global bullion market, now in surplus, and could set the stage for a price recovery.